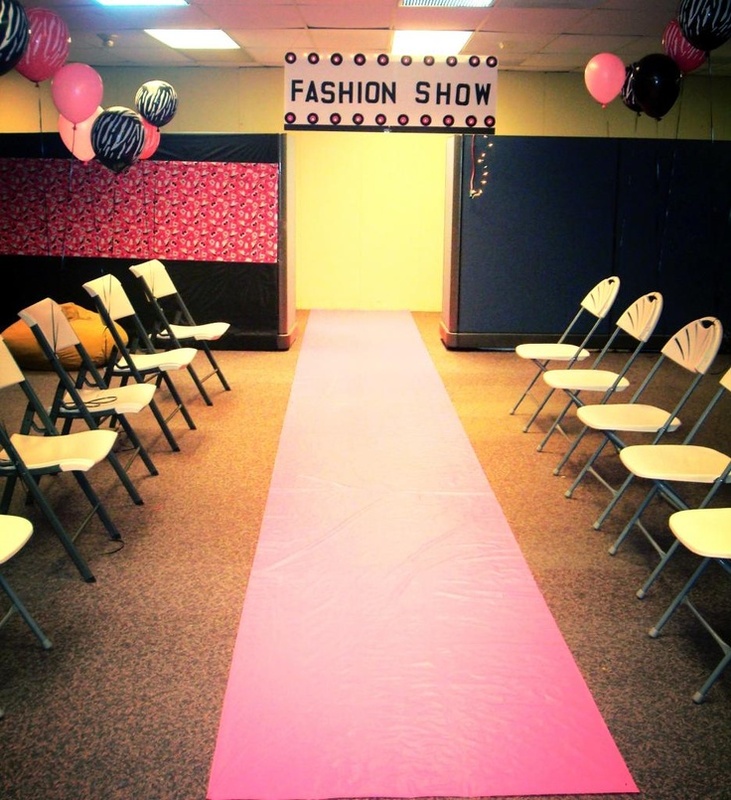 Fashion – Makeover child parties are great for kids with a passion for fashion! 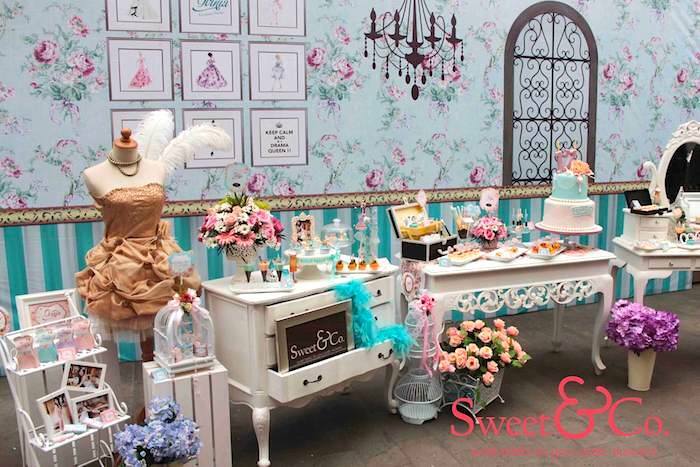 Below you’ll find lots of great ideas for your fashion theme party. Here’s a really cute fashion party invitation idea: take a photo of the birthday child dressed up all dirty and with ugly clothes, hair all messed up, some makeup smeared unfashionably on the face, etc. This will be the BEFORE picture. Then, have them clean up and look great (stylish clothes, hair made really well, make-up, etc.) and take a picture. This will be the AFTER picture. Take a piece of paper that, when folded in half, will fit into the envelope. On the front put the picture of your child all messy and underneath the picture write in big letters “BEFORE”. Then open the invitation and on the inner left side, glue (or print) the picture where your child is looking fabulous and below it write “AFTER!”. Then on the right you still have room to write all the party information. Also, before the address, write your child’s name and then “Beauty Parlor” and/or “Salon” (for example – “Tania’s Beauty Parlor is located at…” or “The party will be taking place at Heather’s Salon”). You can decorate this invitation with a collage of fashion magazine cutouts and write at the top “Fashion Weekly”. On the envelope you can write something like “Girls Just Wanna Have Fun”. A cute idea is to put some red lipstick on the birthday girl’s lips and let her ‘sign’ each envelope with her lipstick lips. You can also give each invitation a small dash of perfume spray for that extra touch! 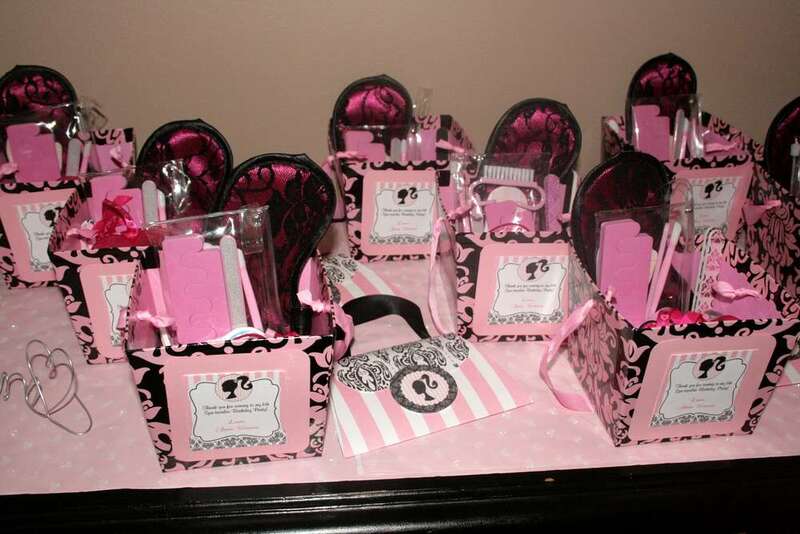 If the invitations will be hand-delivered you can get lots of cheap dress-up purses at the dollar store and put your invitations inside or tie each invitation to a nail polish bottle, lip gloss, and/or lovely smelling soaps. If you have the time to hand write your invitations, consider writing with a gel pen (when writing with a bright gel pen on dark paper – it comes out really beautiful). Consider sprinkling glitter in each invitation for that special touch! 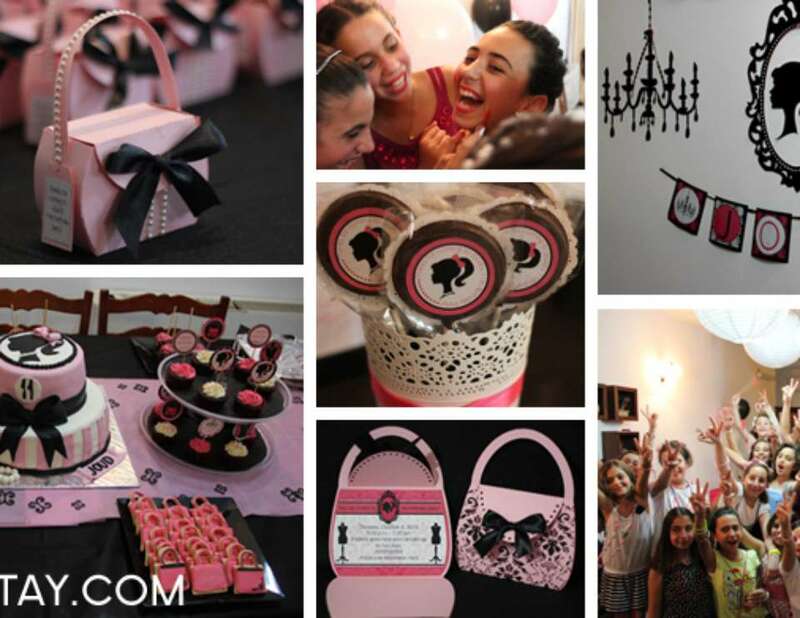 Walk the Runway at Jenny’s 12th Fashion Birthday Party! A Glamour Party that SPARKLES! There’s a birthday girl that we all adore who wants to get glam with a makeover and more! You’re invited to a party that is sure to be fun, we are getting our hair and makeup done! Grab your heels, your super star glasses and your favorite dress up clothes too… We’ll get our nails done and have a makeover before the party is through! For those with passion for fashion! Join us on the runway for some glittery shimmering fun! Calling All Glamour Girls! Come get as pretty as can be… We’ll play dress up at Nancy’s 6th Birthday Party! Tasty treats & dazzling dress-up clothes, shimmering jewelry & hats trimmed with bows. Real china dishes & cups filled with tea, I’m turning 6 – come celebrate with me! Take a little color, add a little shine… My oh my, you look divine! Come primp with Heather on her 7th Makeover Birthday Party! It’s Mandy’s Birthday and she’s turning 3! So wear your dress-up clothes and jewelry! Mirror, Mirror on the Wall, Calling all DIVA’s one & all! The day will be each and every Diva’s dream, filled with make-up, perfume, lotion and cream. It will begin and end with your glam shot, a ‘before’ and ‘after’ picture, believe it or not! It’s time for Tania’s Makeover DIVA Party and you’re invited! Wear your dress-up shirts and fancy skirts, it’s a party you won’t want to miss! Come strut your stuff and do your thing… Walk your walk and let your hips swing! It’s a Fashion Show celebrating Randy’s fifth birthday! Get ready to rock the runway! We’re throwing a fashion show in honor of Tami’s 8th Birthday, so wear your most smokin’ gear for your time in the spotlight! There’s a birthday girl you know, who likes to get dressed up and have a fashion show! Got to be Glam, a celebration of beauty! Come dress up and play with me, and celebrate that I’ll be 3! Please join us to celebrate Sarah’s 3rd Dress-Up Birthday Party! Make up, dresses, hats & pearls, oh what fun for us girls! It’s time to get spoiled and get pampered all day, please join us as we “spa” for Judy’s 12th birthday! (Please RSVP by September 7th to reserve your spa treatment). Ella is turning five… join us for fun, silliness and all that jive… We’ll have dress up, makeup, manicures too… Loads of pictures, and goodies just for you! You are cordially invited to a night of Glitter, Glamour and Glitz as we celebrate Amanda’s star-studded Fashion Party! 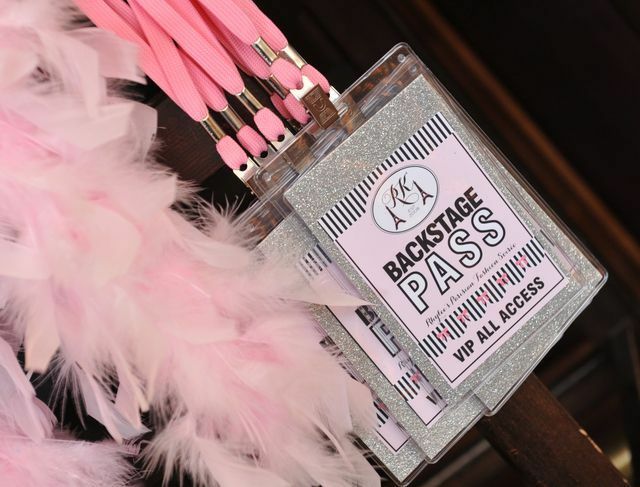 Dresses, boas, hats and pearls… Fun, fun, fun just for girls! We’ll enjoy cake and tea, please come celebrate with me! Manicures, pedicures, facials and more… These are the things we simply adore! Fabulous friends of mine, please join me for a day of pampering, it will be simply divine! Keeping in mind her passion for fashion, we’ll celebrate in style… so the memories of this special event will etch an eternal smile! Please join us for Anne’s 11th Birthday Fashion Party! Oh doll, you look so fine, I love your outfit and your hair looks divine! Come play dress up at Maggie’s 10th Birthday Party Fashion Show! 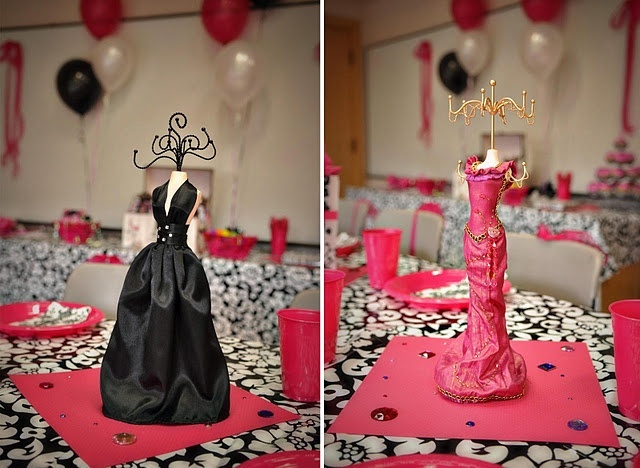 If you’re going for a more ‘Barbie’ child parties fashion theme – on the outside of each invitation, you can give each girl a Barbie name (Princess Barbie, Fairy Barbie, Malibu Barbie, etc) and the boys a Ken name (Prince Ken, Malibu Ken, etc.). 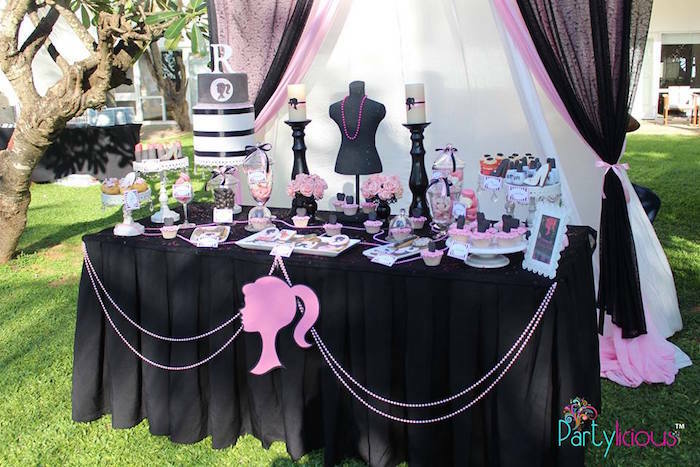 Around the child parties area disperse any type of fashion items you may have – hats, feather boas, flashy sunglasses, high heel shoes, hip fashion dolls, dresses, jewelry, etc. It’s also a nice touch to decorate with flowers, spread flower petals all over the table, in vases, etc. Consider scattering sequins and glitter on tables as well and hanging crystal tear drops (when light shines through creates lovely rainbows). 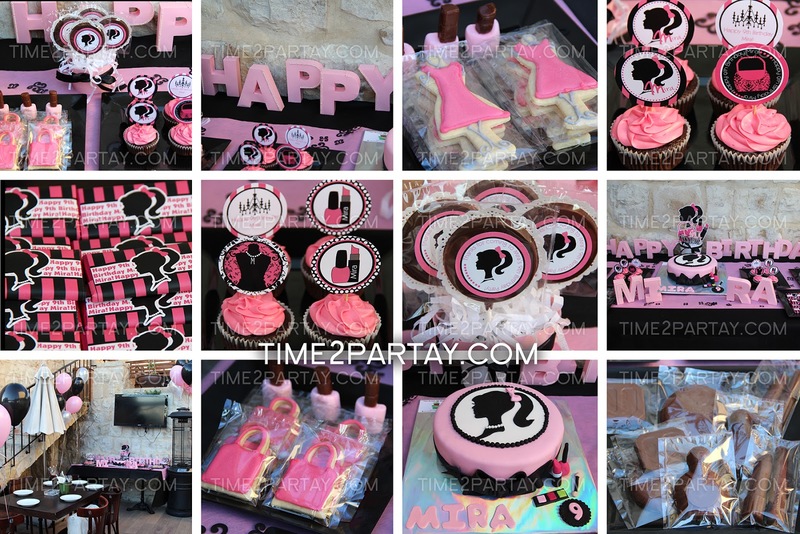 The colors you choose for fashion child parties depend on what style you want. For example, if you want more of an elegant look you would use black and any other color, let’s say black, gold, pink and purple for a color scheme. If you want it to be more playful you could choose pink, purple, and light blue or light green, pink, orange and yellow. It’s best to let your child decide. Once you choose the colors for your fashionable child parties, you’ll want to decorate with lots of balloons, streamers, glittery stars from curly ribbons, etc. Put all sorts of little fashion accessories inside balloons before filling them up (gems, earrings, bracelets, etc. ), and later the kids can pop them and have surprises fall out. A disco ball will also shine up the party area! To make your party entrance glamorous, put up these dazzling metallic curtains in your doorway or around the party area. You can even put a fan behind these curtains and have them blow endless waves of metallic strands. What’s the highlight of fashion makeover child parties? A fashion show of course! You’ll want to assign an area to be the walkway. You can use a long piece of fabric or carpet to be the walkway. A nice idea is to mark the runway edges with a not so high rope made of streamers and/or balloons. To create the effect of a real fashion show you’ll want to make curtains so that the kids can stand behind them and come out one by one. You can even just hang sheets from the ceiling on both sides of the long walkway. A fog machine can make the whole experience a lot more mysterious and dazzling. If you want it more playful you can use a bubble machine. You can then have all kinds of spotlights shining where the fashion runway is (you can use hanging flashlights, Christmas lights, and purchase clip-on lights which you can clip on places to shine on whoever is walking on the runway). You’ll want to put lots of long mirrors everywhere so that the kids can always look at themselves and glamour-up! Cut out lots of different fashion pictures from fashion magazines and put them everywhere (also nice to tape them to balloons). Hang up pictures of famous models and draw mustaches, glasses, and warts on their face. Write “Before” under the picture and then find other model pictures and leave them as they are, write “After” underneath them. If you’re having different child parties makeover stations you can put up different signs saying things like “Ashley’s Beauty Parlor” or “Judy’s Dazzling Hair Salon”. You can put lots of pretty dress-up clothes (skirts, blouses, boas, tiaras, high-heeled shoes, ribbons, shawls, hats, gloves, costume jewelry, etc.) to create your own high fashion wardrobe in a room or area (put oversized price tags on each piece of clothing) that can be designated as the “fashion shop”. Once kids start coming, give them some play money and tell them they can “shop around” for clothes. For the napkin holders, cut around each one and fold in a circle around a napkin, then secure with tape when both ends meet. On each placecard page there are 4 placecards, print, cut each out, and fold each in half. On the placecards you can write each guest’s name by adding “Model” or “Supermodel” before or after their name (for example: “Supermodel Nancy”). If you’re leaning more towards a spa theme child parties, set up the party area with all kinds of aroma therapy candles, little face towels, soft pillows, all kinds of lotions, toe separators, different colors of nail polish, lots of fragrant flowers, and all kinds of magazines to read. Music will always hype up the energy at child parties! Create your own CD with music that fits the fashion theme. Songs that are great for the runway are Madonna’s “Vogue”, RuPaul’s “Supermodel”, Jimmy James’ “Fashionista”, the song “Lady Marmalade” from the Moulin Rouge movie, Cindie Lauper’s “Girls Just Wanna Have Fun”, and Diana Ross’ “Baby Love”. If it’s a small group of kids you can also take them to a real Beauty Salon or Spa to get their nails done, or 15 minute facials, etc. If the kids want to go through a full makeover, you can create stations either in different rooms or in different designated areas, as in a make-up station, hair salon, pedicure and manicure area, clothing section, etc. In the clothing section have a box full of fun clothing accessories the girls can wear like costume jewelry, feathery boas, hats, sunglasses, etc. If you have any thrift or Salvation Army stores in the area you’ll find lots of costume accessories at very low prices. Make sure to have lots of cotton swabs, pads, and tissues for applicators to minimize germ transfer, and small trash-cans nearby to simplify clean up. Add fun accessories as glitter, nail polish, lip gloss, eye shadow colors, etc. You can ask some of your friends to help you. It’s great if there are some teen sisters, babysitters, neighbors, etc. They’ll have fun doing it and you can treat them with a small gift (remember to take ‘before’ and ‘after’ pictures!!). To intensify the difference between the “before” and “after” pictures, as the girls arrive give each one an old yucky outfit. Once they’re dressed, smear cookie crumbs on their face, black out a tooth, and mess up their hair – this can be quite hilarious! Once each guest arrives you can give them a robe to wear, a quick facial with cucumber slices on their eyes, a little towel wrapped around their head, and there you’ve got another great “before” picture. If you’re having an ALL girl’s party, you can invite the girls to come with their mothers. Then invite a make-up specialist who can teach everyone tips and tricks with makeup, how best to apply it, different and better brands, etc. Then everyone can give each other makeovers. 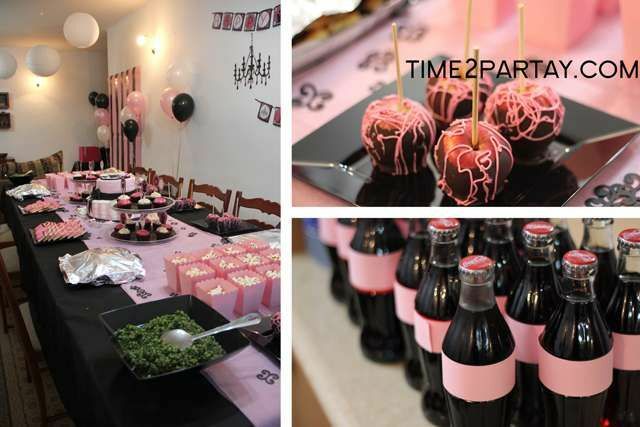 This is a great way moms can also have fun together with their daughters at child parties! All you have to do with the above printable fashion hats, is print them out, cut around the half circle, roll each of them up, staple, and staple on flexible string to both sides of the cone so that guests can secure the hats around their chin. Gather as many old fashion magazines as you can (you might be able to find them at hair and beauty salons). Disperse all the magazines on a craft table with scissors and glue. Let the girls cut out their favorite fashion clothes from the magazines and make their own fashion collages by gluing them to a piece of bristol paper. After everyone has made their own fashion collage, you can start a discussion about each guest’s likes in regards to fashion, design, color, etc. Here is where you can give the kids a creative opportunity to be young designers. What you’ll need is large pieces of butcher paper. You can tape the butcher paper on the wall or lay it on the floor if you have a smooth surface. Let the kids trace each other and give them each crayons, markers, paints, glue on gems, scrap fabric, etc. to decorate and make up their own unique fashions on their own body outline. A great activity for fashionable child parties is to let the girls make their own beaded jewelry. You’ll find lots and lots of different bead shapes, sizes, colors and other materials at a nearby craft store. If you’re inviting boys to the party, necklaces and bracelets made with wood or ceramic beads strung on leather are very popular with both boys and girls. You can also have the kids make jewelry out of candy by using licorice strings for thread and Fruit Loops, Life Savers, Gummy Savers, etc. for the jewels. It’s a great idea at such child parties to let the kids make lots of wearable items out of flowers. They can make headbands, bracelets, necklaces, etc. You can either gather or buy fresh flowers, or purchase silk/paper flowers at a craft store. Put plastic headbands on the tabke and they can then glue on the headband all kinds of flower and heart shapes. Another way is to provide each kid with a piece of ribbon, about 3 ft long and demonstrate how to start. Lay the ribbon on a table, hold a flower by the stem and lay it flat on the ribbon. Then tightly wrap the ribbon around the stem and add another flower (make sure the stems are lying flat on the ribbon as you wind the ribbon around them). Keep this going until you have a wreath large enough to fit a wrist or head, and tie a knot with the extra ribbon. You can use different colors of flowers and a few colors of ribbons for a pretty effect. This cool child parties activity makes a great party favor. Give each kid some pretty and colorful papers and let them decorate it with crayons, markers, glitter, etc. Once they’re done have them fold the paper like an accordion. Fasten one end with tape or a staple for the fan handle. Then delicately spread the other end out for a beautiful fan! The guests can make their own body glitter using aloe vera gel and glitter! At a craft store buy little plastic containers and give one to each guest. Then let them fill their container with aloe vera gel and pour small amounts of colorful glitter into the aloe vera. Then with a stick they mix the gel with the glitter and Voila! Body Glitter! After closing the lid they can decorate with stickers, markers, etc. and take home as a favor. 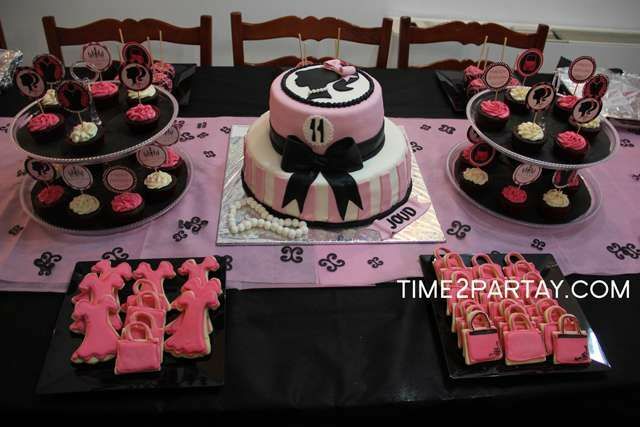 Take a look at all the coolest homemade Fashion-themed birthday cakes. Granola, Yogurt and Fruit: A light and tasty treat. In parfait cups, layer yogurt (any flavor you choose), granola and fresh fruit (strawberries, bananas, raspberries, etc.). Pink Macaroni and cheese – buy white cheese macaroni boxes and once it’s cooking add a few drops of red food coloring to make it pink. Heart and Star Pizza – if you have patience, you can make or order pizza, and then cut out the pepperoni into star and heart shapes (you can stack the pepperoni’s on top of each other and cut with a cookie cutter, or with a knife). If your making homemade pizzas, you can cut the dough into these shapes! Tip: On bowls and such you can put fabric trimmings (even your bowls can be fashionable!). And remember – you can make almost anything pink with just a little bit of red food coloring. Pretty Pink Lemonade – you can either purchase pink lemonade, or make your own. Combine 1 cup lemon juice (from freshly squeezed lemons), 2 cups of sugar (you can make the sugar dissolve by putting it in a small cup and adding just a few drops of boiling water); then stir until sugar has dissolved. Pour this mixture into a 2-quart container and fill the rest with cold water (to make it pink add a couple drops of red food coloring). Using a star-shaped, heart-shaped, and/or a flower-shaped ice tray, prepare cool-shaped ice ahead of time. When it’s time to serve, you can also garnish with a little cute umbrella. Sparkling Apple Cider (you can pour it into disposable plastic wine glasses and let the kids decorate the glasses with jewels, sequins and glitter beforehand). Daiquiris (no alcohol of course! ): Why not treat the kids with great-tasting different flavored “grown-up” drinks?! Tip: cut slices of lemons and strawberries, and then stick them on the rims of the cups. Champagne (kid-style! ): Mix together 4 parts carbonated water, with 4 parts ginger ale and 3 parts white grape juice. Fruit shakes made of all kinds of yummy fruits (choose from strawberries, bananas, dates, melon, and any other fruits your child may like). You can have the shakes based on water, milk, yogurt, or orange/lemon juice. Pink Sweet Popcorn: Boil two cups of sugar, one cup of light corn syrup, and 2/3 cup of margarine for a few minutes. Then stir in two packs of pink or red Kool-aid and one teaspoon of soda. Then pour this mixture over about 6 quarts of popped popcorn and bake at around 225 F for at-least 45 minutes (stirring the popcorn every 15 minutes). Once done, remove from the oven and break up. Strawberries to Dip: You can have different sweet sauces such as chocolate, butterscotch, cream, etc. Frozen Grapes: This is a delicious treat and very simple! Just freeze different colored grapes in the fridge and after a few hours you have little grape icicles. Fruit Skewers: Cut up various fruits and place them on skewers (strawberries, pineapple, grapes, cantaloupe, honeydew, watermelon, etc.). For the child parties favor box and medium favor bags – print, color if needed (or print on colored paper) and cut out. Before you start gluing the favor box, fold along the dotted lines and assemble so that all the sides connect. Only then add glue and secure the folded flaps. To create the large favor bags you’ll need to print out TWO designs for one favor bag. First, cut along the lines and fold along the dotted lines. Then, connect the two so that the left side of one is glued to the right side of the other. 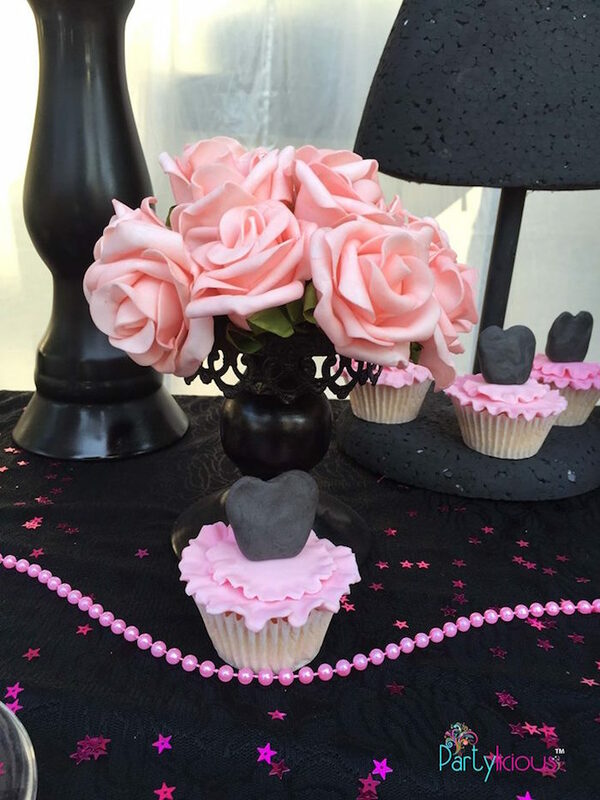 A nice child parties idea instead of favorbags, is to fill jewelry boxes or small velvet bags with all kinds of “girly” accessories, such as glitter nail polish, fashion stickers, lip-gloss, pink bubble gum, tiaras, dolls, rings, charm bracelets, necklaces, fingernail tattoos, shower loofahs, shower gels, plastic hair-brushes and/or combs, little face towels, shower caps, bath salts, lovely smelling candles, little notepads, body glitter, hand lotion, cute fashion key-chains, body spray, hair bows and clips, little mirrors, etc. (basically anything that is fashionable or has to do with getting a makeover!). Another great idea for child parties favors (you’ll need a digital camera and color printer) is to take “before” and “after” pictures of the girls, print each picture out as many times as there are guests, have them autograph their pictures, and put them inside small photo albums. You could probably get these albums pretty cheap from a nearby photo shop and have the girls decorate them beforehand. This is a really cool souvenir from the party.